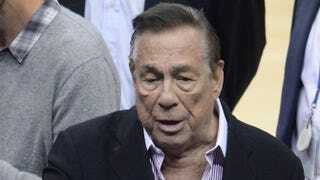 The divorce proceedings involving owner Donald Sterling and the Los Angeles Clippers were officially set in motion Monday when the NBA charged the embattled owner with "damaging the league and its teams with his racist comments," the Associated Press reports. Sterling has less than 10 days to respond to charges and then a hearing will be held June 3. After the hearing, owners will vote on whether to terminate Sterling's ownership. According to AP, Sterling has also been charged with "destroying evidence and providing false and misleading evidence to the NBA investigator." The news site also noted that the Clippers owner issued a "false and misleading media statement about the matter" and failed to "…use best efforts to see to it that the sport of professional basketball is conducted according to the highest moral and ethical standards." The NBA also alleges that the banned-for-life owner engaged in other conduct that has "impaired its relationship with fans and merchandising partners," AP reports. "All of these acts provide grounds for termination under several provisions of the NBA constitution and related agreements," the league said in a statement viewed by AP. According to AP, Sterling has until May 27 to respond to the charges levied by the NBA. Sterling has hired counsel and his lawyer can attend the hearing and present evidence on his behalf but "strict courtroom rules of evidence would not apply." Earlier this month, NBA Commissioner Adam Silver issued a $2.5 million fine against Sterling, the largest fine allowed under the NBA constitution, and banned Sterling for life after TMZ released taped conversations during which Sterling made several racist remarks. Maxwell Blecher, Sterling's attorney, asked to delay the hearing for three months, but the league will not grant that request, a person with knowledge of the matter told AP on the condition of anonymity. The NBA would only need three-fourths of the 29 owners to vote against Sterling, and he would be forced to sell his team. Silver has said that he is confident that he has the 23 votes to force Sterling to sell the team. "Mr. Sterling's actions and positions significantly undermine the NBA's efforts to promote diversity and inclusion; damage the NBA's relationship with its fans; harm NBA owners, players and Clippers team personnel; and impair the NBA's relationship with marketing and merchandising partners, as well as with government and community leaders," the league said in a statement viewed by AP.